Instrumentation (I) refers to changes in the measuring instrument, in the observers, or ir I the scores themselves. Sometimes, measuring instruments are modified during the course of an ex periment. In the advertising experiment, ifa newly designed questionnaire was used to measure the ‘posttreatment attitudes, this could lead to variations in the re ponses obtained. Consider an experirnsnr in which dollar sales arc being measured before nnd after exposure to an in-store display (trea’lment). If there is a nonexperimental price change between 01 and °2, this results in a change in instrumentation because dollar ales will be measured using different unit prices. In this case, th’~ treatment effect (02 – 0t) could be attributed to Iichange in instrumentation. Mortality (MO) refers to the loss units while the experiment is in progress. This happens for many reasons, such as test un;.ts refusing to continue in the experiment. Mortality confounds results because it is difficult to Determine if the lost test units would respond in the same manner to the treatments as those that remain. Consider again the merchandising display experiment. Suppose that during the course of the experiment, three stores in the new display treatment condition drop out. The researcher could not determine whether the average sales for the new display stores would have been ~Nigher or lower if these three stores had continued in the experiment. The various categories of extraneous variables are not mutually exclusive. The)’ can occur jointly and also interact with each other. To illustrate, testing-e maturation-c rnortallty refers to a situation where, because of pretreatment measurement, the respondents’ beliefs and attitudes change over time and there is a differential loss of respondents from the various treatment groups. Controlled-distribution electronic te~t markets are used increasingly to conduct experimental research on new products. This method makes it possible to control for several extraneous factors mat affect new product performance and manipulate the variables of interest. It is possible 0ensure that a new product: (I,>obtains the right level of store acceptance and all commodity volume distribution, (2) is positioned in the correct aisle in each store, (3) receives the right number of facings on the shelf, (4) has the correct everyday price, (S) never has out-of-stock problems, and (6) obtains the planned level of trade promotion, display, and price features on the desired time schedule. Thus, a high degree of internal validity can be obtained. 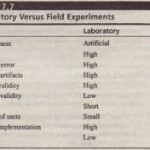 Experimental designs may be classified as experimental, true experimental, quasi-experimental, or statistical (Figure 7.1). Experimental designs do not employ randomization procedures to control for extraneous factors. 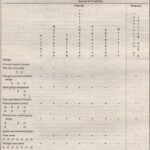 Examples of these designs include the one-shot case study, the one-group pretest-posttest design, and the static group. In true experimental designs, the researcher can randomly assign test units and treatments to experimental groups. Included in this category are the pretest-posttest control group design, the posttest-only control group design, and the Solomon four-group design. Quasi-experimental designs result when the researcher is unable – to achieve full manipulation of scheduling or allocation of treatments to test units but can still apply part of the apparatus of true experimentation. Two such designs are time series and multiple time series designs. A statistical design is a series of basic experiments that allows for statistical control and analysis of external variables. The basic designs used in statistical designs include preexperimental, true experimental, and quasi-experimental. Statistical designs are classified on the basis of their characteristics and use. The important statistical designs include randomized block, Latin square, and factorial. These designs arc illustrated in the context of measuring the effectiveness of a test commercial for a department store.